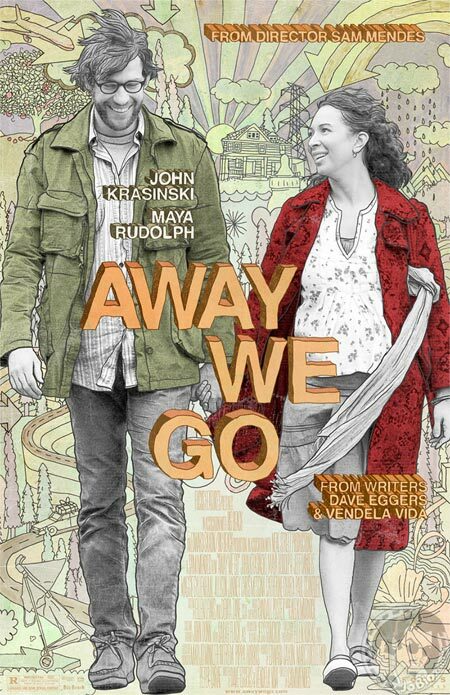 Away We Go wanders happily between comedy road trip and thirty-something coming-of-middle-age-drama. This film belongs to that branch of the road movie in which characters examine their pasts to confront present dilemmas. Directed by Sam Mendes, who also directed American Beauty (Kevin Spacey, Annette Bening), Jarhead (Jake Gyllenhaal), Revolutionary Road, (Kate Winslet, Leonardo DiCaprio), and Road to Perdition, (Paul Newman, Tom Hanks), Away We Go does not stray from the themes of Mendes’ previous films, as it, too, is about seemingly ordinary people coming to terms with their lives. The lead actors in Away We Go are not A-lister’s (a nod to independent filmmaking) but have done good work on TV and small film roles. Verona – played by Maya Rudolph – is hilarious in a deadpan, understated manner. Bespectacled college dropout Burt – played by John Krasinski – is charmingly idiosyncratic. Burt and Verona are expecting their first baby. When Burt’s parents, the couple’s sole reason for moving to their current dreary town they call The Place We Live At the Moment, decide to leave the US, the couple go on a trip cross-country to find somewhere else to raise their child, beginning a disillusioning odyssey pretty much visiting any friend who has ever reproduced. During a particularly fraught, affecting visit, Verona has an epiphany about her own childhood which clarifies their lives: everywhere they’ve learnt lessons from those they meet about how not to raise children – apparently, the answer to their problems is that they don’t have to depend on the support of friends or the kindness of strangers. Bravely, this film posits a relationship in which the couple are completely and happily in love, without underlying secrets waiting to ruin everything. Happiness is a difficult narrative concept to maintain, being, by definition, free of dramatic incident, but the lead couple are so charismatically and likeably written and played that even an uneventful trip on a train becomes high comedy. Arguably, those they meet along the way are cliché, but they’re balanced by the completely believable leads who seem themselves unable to believe these people are quite real. I believe this is a film worth seeing because it’s simply a poignant and funny film. Also, I believe that if you’ve liked even one film from a given director (and I’ve liked all of Sam Mendes’ films), then you should give all of their work a ‘look-see.” Finally, the film works through striking scenes and splendid moments, rather than as a continuous whole, and, thanks to the cinematographer and production designer’s efforts, there is a distinctive regional look to each episode.